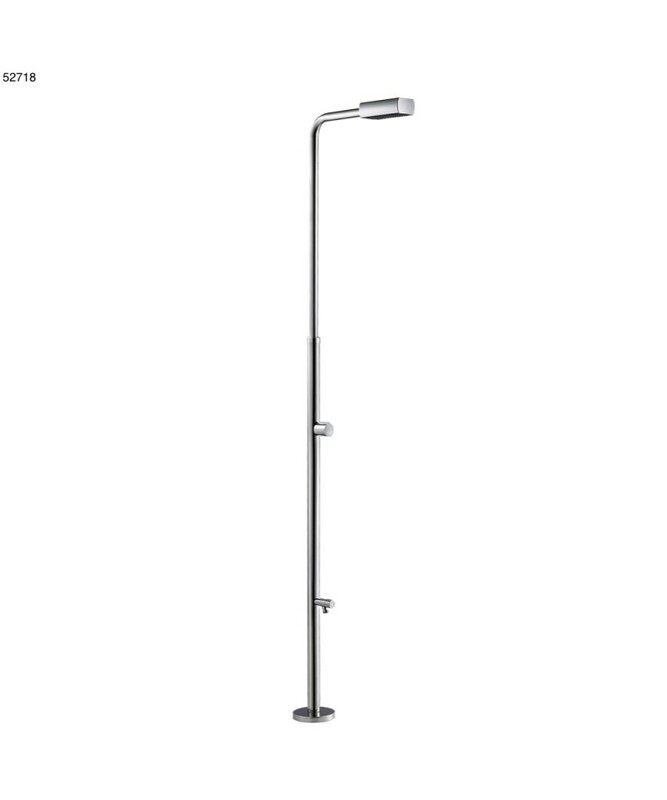 Always known for quality, Astralpool presents this swimming pool and garden shower with foot washer in polished AISI 304 stainless steel (diameter 43 mm) with 1 chromed anti-limestone shower head and 1 faucet. 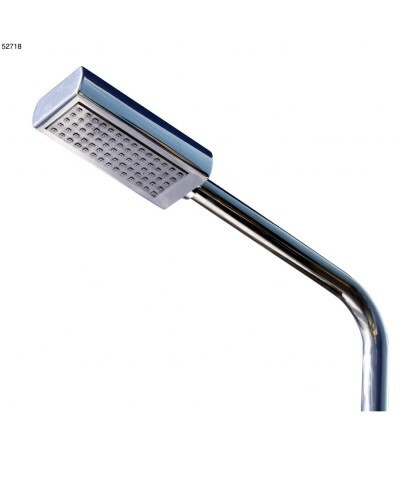 Product gender: Shower for swimming pool..
Material: 304 Stainless Steel Chrome Plated. €156.85 Vat incl. €156.85 Vat excl. By buying this product you can collect up to 15 loyalty points. Your cart will total 15 points that can be converted into a voucher of 3. To complement any type of pool. With built-in anchor for models 52717-52718. 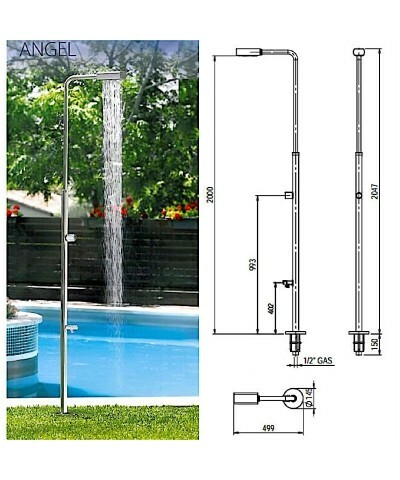 Single-lever ANGEL shower with one shower head and foot washer, a sober design and a high quality fabrication make this model the right choice to complement any type of pool. 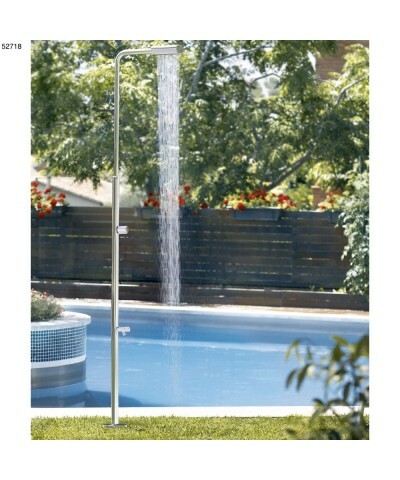 Combinable with Shower tray (code 00103 Dimensions 80 cm x 80 cm with adjustable bottom outlet. Grid Ø 130 mm. Connection Ø 50 mm. Made of polyester and glass fiber). Contact us for more information. Price €143.64 €143.64 Vat incl. €143.64 Vat excl. Always known for quality, Astralpool presents this swimming pool and garden shower in polished AISI 304 stainless steel (diameter 43 mm) with 1 chromed anti-limestone shower head and 1 faucet. Price €715.33 €715.33 Vat incl. €715.33 Vat excl. Niágara Solar Shower in polished stainless steel AISI-304 with 1 square shower head (150mm x 150mm) and a single-control mixing valve (cold and hot). It uses solar energy to heat the water thanks to a 30lt tank that accumulates and remains perfectly integrated into the main structure of the shower. Price €465.97 €465.97 Vat incl. €465.97 Vat excl. 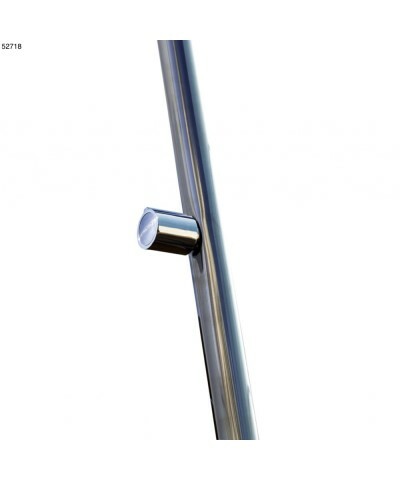 Niágara shower in AISI-304 polished stainless steel with 1 square shower head (150mm x 150mm) and 1 valve. Alternatively, there is the possibility of powering it through it via a solar energy system. Price €344.16 €344.16 Vat incl. €344.16 Vat excl. A simple design and an Astralpool production which has always been known for quality, features this ANGEL shower with double faucets and double anti-limescale shower heads for pool and garden in polished AISI 304 stainless steel (diameter 43mm). Price €329.22 €329.22 Vat incl. €329.22 Vat excl. ANGEL Solar Shower in gray painted aluminum, uses solar energy to heat the water, has only one mixing faucet (cold and hot).